At Spring Mist Spa, we are Electrolysis experts. If you are looking to permanently get rid of unwanted hair, then Electrolysis at Spring Mist Spa is the right solution for you. Electrolysis is the ideal treatment to permanently remove unwanted hair. It works where Laser treatment does not work or isn’t safe to use. It can be used to remove hair on eyebrows, hairline, upper and lower lips, cheeks, chin, sideburns, bridge of the nose and in between eyebrows. Electrolysis is also very effective in removing hair from medium sized areas such as neck, shoulders, underarms, abdomen and bikini line. Laser treatment does not treat blonde, grey or white hair. Electrolysis can remove hair of all types regardless of hair color or skin color. Any hair left behind by laser can be effectively removed permanently by by this very effective treatment. At Sprig Mist Spa we employ the best industry practices in all our treatments in a hygienic environment. We take pride in providing all treatments at affordable prices with premium service. To book your free consultation call spring Mist Spa today at 289 350 0321. 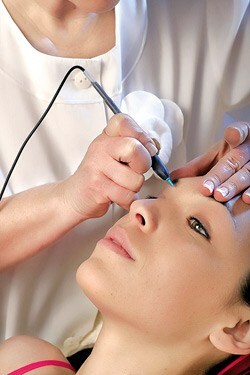 Electrolysis works by carefully inserting an extremely thin metal probe into each individual hair follicle (the root). An electrical current is then passed through the microscopic probe and into the follicle to destroy it. Once a hair follicle has been destroyed hair is no longer able to grow back from it. However, since each individual hair follicle is not in the exact same growth stage at any given time, multiple sessions are often needed. Electrolysis is a highly effective method of permanent hair removal but the success of the treatment is dependent on the skill of the esthetician. When done correctly, results are beautiful. Electrolysis has few to none risks for a healthy person. Post treatment, the skin may be red, inflamed or tender to the touch. These side effects are temporary and should be gone within 12-48 hours post treatment. Any redness is easily covered with makeup afterwards. Please make sure to tell your aesthetician about any health concerns you have before deciding to get a treatment done (diabetes, blood thinners, blood pressure etc.). Only mild discomfort is felt when the electrical current enters the hair follicle. This treatment is never commonly described as painful and no discomfort remains after the treatment session is over. Any area with unwanted hair can be treated with Electrolysis. However, since the treatment works by removing each individual hair follicle, it is better to do it on smaller areas or larger areas that have already been treated with laser. Most common are eyebrows, upper lip, cheeks, chin, neck, chest, abdomen and bikini line. The length of the treatment will be predetermined by the esthetician in a consultation and is dependent on the size of the area being treated. Larger areas will require more time. Electrolysis sessions are usually done in 15, 30, 45 or 60 minute intervals per session. No set number of treatments can be predetermined as it is dependent on many factors such as size of the area being treated, how many hair follicles there are and whether or not they’re in the active stage during treatment. It is common to book appointments weekly at first and then gradually less often as hair lessens. It is typical to expect 20% regrowth 4-6 weeks after each treatment. Is Electrolysis better than laser? Electrolysis differs from traditional laser because it can treat white, gray or blonde hair that laser cannot detect. As laser hair removal only targets the pigment in the hair, it cannot treat lighter coloured hair. Laser is better for larger areas with dark hair while Electrolysis works best on small to medium sized areas with finer hair. It’s a perfect treatment for those who have had laser treatment and have some remaining stray hair that laser did not work remove. This method sticks out from other hair removal techniques because it is the only permanent hair removal solution.